Dhalsim is back for Street Fighter V! Another archetype-establishing character for fighting games, Dhalsim is back with one hell of a makeover. Fun fact: with Dhalsim’s arrival, eight of the returning characters present for Street Fighter V (Ryu, Ken, Chun-Li, Cammy, Nash/Charlie, M.Bison, Zangief, and now Dhalsim) were eight playable Street Fighter representatives in X-Men VS Street Fighter, the pioneering game in the VS Series of Capcom fighting games. Anyway! His V-Skill is the Yoga Float. Dhalsim will float in the air for a few seconds or so, but this can be cancelled through special attacks or air normals. Besides added air movement whilst activated, this allows for some tricks unique to Dhalsim, especially compounded with the ability to activate this in the air, which can make it harder for your opponent to predict when you’ll land from a jump. His V-Trigger is the Yoga Burner, which is basically like a small flame carpet that occupies a fixed amount of space on stage for a period of time. It doesn’t appear that it places the opponent in hitstun, but the opponent will lose (recoverable) damage if they stay on the burning space. Capcom has also announced that Street Fighter V will release on February 16 for North America and Europe. 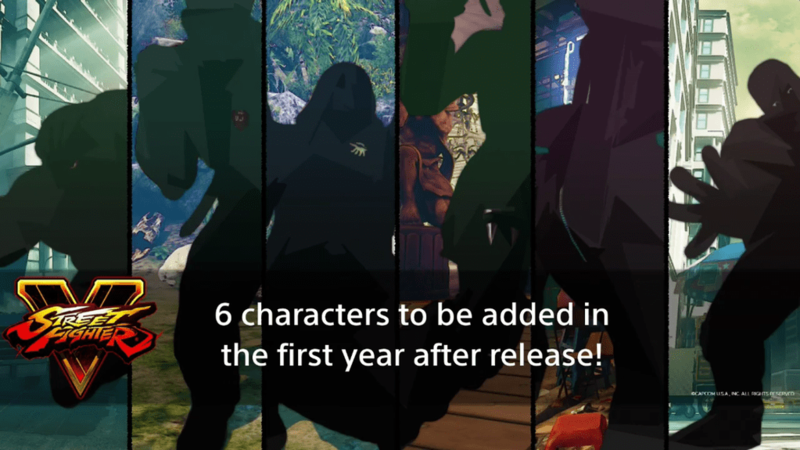 Additionally, six new characters are planned to be added to the roster throughout the course of the year 2016, bringing the roster to 22 by 2017. A preview of those characters is shown above. Any idea who they are? Capcom also offered some new details on acquiring these new characters. You may already know that unlockable content can be acquired through Zenny (representation of your real life currency transferred to the game itself) or Fight Money. The latter is primarily acquired through either completing Daily Goals or “leveling up” characters. Daily Goals are generated every day and require the completion of some sort of task in-game, such as “break X amount of throws” or things of the sort. The Fight Money reward scales with the perceived difficulty of the Goal. Players can also “level up” individual characters to earn Fight Money. “Leveling up” is a figurative expression of toying around with available characters in specific game modes; it doesn’t actually affect the design or strength of any individual character. Capcom hopes that this idea of leveling up characters encourages players to experiment with a wide variety of characters. Be sure to check out the Paris Games Week trailer featuring Dhalsim below! He will be playable at Paris Games Week, too. Previous Post:The Legend of Heroes: Trails in the Sky SC Stream, Giveaway and Support!